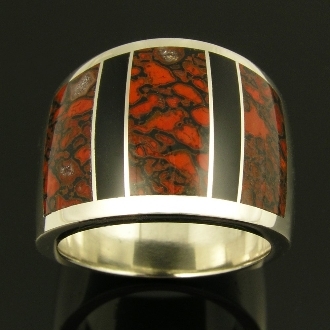 Wide sterling silver ring band inlaid with rare red dinosaur bone and black onyx. The two black onyx pieces accentuate the black webbing in the red dinosaur bone. The red cell dinosaur bone is well agatized, creating a fairly hard stone that takes a good polish. There are also some neat calcite crystal cells surrounded by the black cell wall matrix. This Utah dinosaur gem bone came from the Colorado Plateau and was a living animal during the Jurassic Period around 144 to 208 million years ago. Ring is 17mm wide and is a size 7. Ring can be special ordered in other sizes. I do not have much of this material so hurry if you need a special order size before I run out!